The Runaway Digimon Express may look kind of cliche and boring but it’s much more than it seems to be. It’s short length doesn’t stop it from having a solid story, all important Tamers characters, very interesting moments yet not feel crammed even a little. There’s not much a of deep storyline, it’s basically just about stopping Locomon. However, that doesn’t mean that it ends there. We get slowly uncovering mystery of how and why Locomon got into the real world and what it wants . Not even the fight against it is straight forward or plain and it’s full of surprises. The only problem I had with story is that it’s a little cliche and unoriginal at the beginning. I don’t see anything wrong with art. It’s the same as Tamers had and that was over average. Sound wasn’t different from Tamers either, however, the inserted song is truly a gem and even though it may seem random at first glance, it truly belongs there and couldn’t imagine it without it. Not to mention that it’s a tearjerker. This was already one of the best things in Tamers and this film is like a cherry on top. There isn’t much character development but we get more information regarding Ruki’s past and her emotions. I truly love this film because it does Tamers justice. Unlike a few other Digimon films, this has every right to belong to the Tamers season. The action scenes were very good and I also really liked the introduction and how every tamer saw Locomon and got to him. This is a must watch for everyone who likes Tamers season and Ruki. Since every tamer makes an appearance, everyone can find the characters they like in this film. Why did they call this a movie, it takes about a half hour to finish, it could be called a special. That was the first disappointing thing about this, I expected a movie, that at least would take longer then a hour, but then I got this. Then the story, it's a fun idea, but not to make a special thing, like a movie for it. This is something to do in the series. Anyway, it's a nice story, but that's it, I love Digimon, it's one of my favorite show, so is Digimon Tame...rs, where this movie is from. But the whole storyline is too childish, some things don't work out either, there are also dialogue's that make no sense at all. The art is like it's supposed to be, the animation is the same like in the series, nothing new or improved. The characters are still the same, we get some new flashbacks about Ruki when she's possesed. Sound's good. 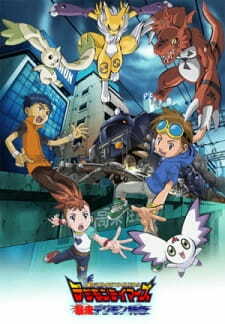 Although it's short, and the storyline is simple and childish, it's worth watching if you're a Digimon fan. Guilmon makes it extra enjoyable like always of course. This anime wasn't bad, but it wasn't great either. The story was very basic and while there was some action the whole story was very lacking. Also this is a movie although its just 5 minutes longer than a normal anime episode. The best part of this special was the out of place jazz music which didnt fit with anything that was happening on screen and was the only enjoyment i got out of this. If it wasn't for the jazz this anime would have gotten a 2 or 3.